It produces 4x40mm cross-cut strips, and comes with a 130-sheet automatic sheet feeder for unattended shredding. 26L bin capacity. By far the lowest price on Camel Camel Camel; other sites have it at £165-200. The point is that you load it up with a pile of paper and leave it to get on with the job. 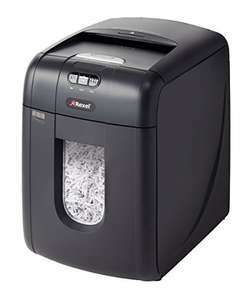 Think of it as £30 for a shredder, and £100 not to have to stand over the machine feeding pages in a few at a time. The point is that you load it up with a pile of paper and leave it to get …The point is that you load it up with a pile of paper and leave it to get on with the job. 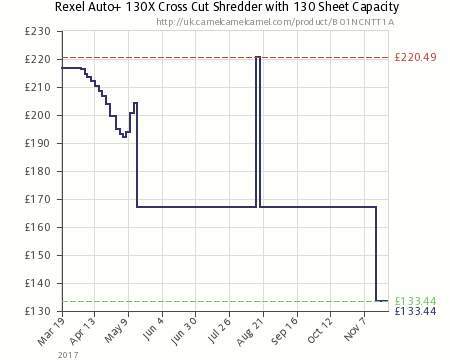 Think of it as £30 for a shredder, and £100 not to have to stand over the machine feeding pages in a few at a time. Get them to wear a shirt with a nice long tie while they're doing it to make them look smart - like they're working in an office! Get them to wear a shirt with a nice long tie while they're doing it to …Get them to wear a shirt with a nice long tie while they're doing it to make them look smart - like they're working in an office! Good idea! Maybe a stapler and guillotine aswell. If you want the job done right you need to provide the tools! Good idea! Maybe a stapler and guillotine aswell. If you want the job done …Good idea! Maybe a stapler and guillotine aswell. If you want the job done right you need to provide the tools!